FRANPRINT has a long history of experience in kakemono printing and assembly. In partnership with many national and international companies, we are constantly developing new procedures to improve our print quality. Our products that are delivered have a perfect finish for the greatest satisfaction of our customers. FRANPRINT is inspired by new advertising trends in order to improve its services and relies on experienced employees in the fields of visual communication, marketing and printing. FRANPRINT makes different types of kakemonos for its customers. The use of kakemono as an advertising medium is widespread in shops, exhibition halls, offices, reception halls, waiting rooms, windows, exhibition stands, shopping malls, etc. The kakemono brings a touch of elegance and is a distinctive element in many outlets. We are able to make kakemonos for several types of companies such as: pharmaceutical companies, optical brands, fashion brands, lingerie, hair salons, etc. Our website will provide you with more information on all our products. You have the opportunity to request a free quote. Trust us to achieve convenient support that will benefit from a lightweight design, but firm and very easy to use. It is designed for indoor use only during your events. It can be assembled quickly without any difficulty and its transport does not require any particular effort. The L-Banner makes it possible to quickly change visuals thanks to its system of upper and lower clipping rails. The print is inserted into said rails. We print a perfect image in four-color HD. The canvas on which we print the image is of superior quality. It is resistant and does not tear. 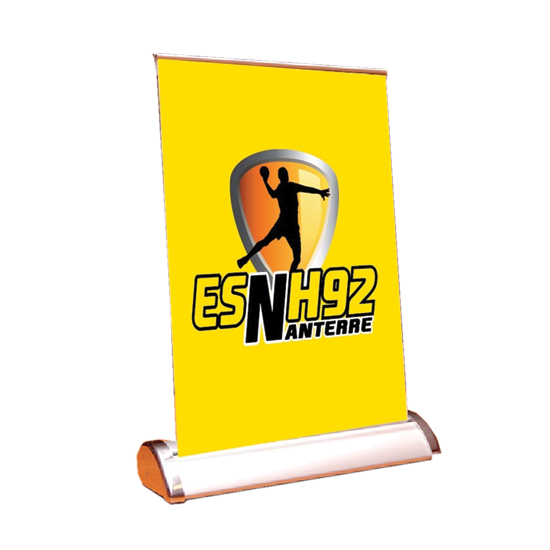 With the L-Banner, the options are numerous and we guarantee you a high visual impact. Unlike the X-Banner, the L-Banner has better ground stability despite its lightweight aluminum structure. Its price is advantageous and we deliver it to you with a transport bag. You can easily display the colors of your company or pass any type of message during an event or a trade show. The personalized L-Banner is an original product that does not go unnoticed. It will attract customers and improve your brand and reputation. If you want to draw attention to your products and services, Point of Sale Advertising is the perfect tool. Through the combination of point-of-sale advertising media, we can help you orient or influence the choice of the buyer. The main feature of this offer is to highlight advertising elements through different media. These are indoor posters, floor-standing cartons or permanent displays, digital screens, carriage displays, stop-rays or leaflets. 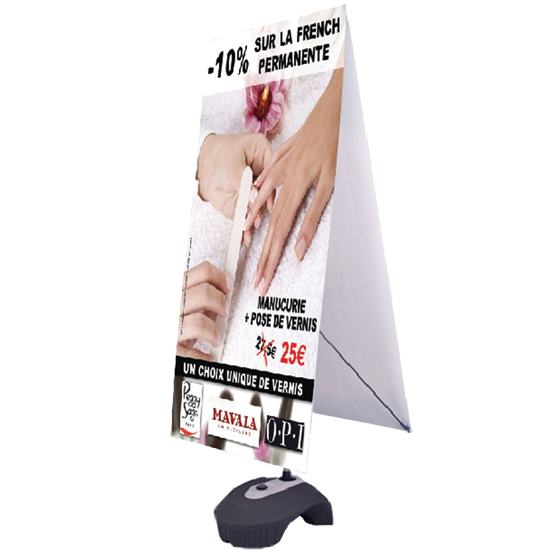 FRANPRINT has the expertise in the creation of Point of Sale Advertising. We offer you a wide range of solutions and products that can be fully adapted to your needs. If you want a tailor-made production, we will produce POS that will be the perfect reflection of your ideas and needs. We do not skimp on quality. That is why, whatever the quantity requested, we are ready to evaluate your requests with professionalism. We are at your service and we will surprise you with our spirit of innovation and creativity. We put at your disposal a multitude of solutions to personalize your commercial space. FRANPRINT manufactures roll up displays to help you consolidate your visual identity. Our roll up displays are strong and durable; they are made to allow you to make editing easy and fast. Indeed, our advertising displays are created to help you easily organize your booth at your indoor events. They are perfect media for floor plan, roll banner, x banner, countertop, etc. There are several widths for the display. Commonly, the 85 × 200 is used, but it is possible to order 100 or 200 cm wide. As for the height, it can vary from 160 to 300 cm. However one has to be aware, that the size is strongly related to the message or the background of canvas. If the message is important, it is better to opt for a large size. The most economical and most ordered model is the 85 × 200. It is easy to move and ideal for good promotion of your business. This is the entry-level model. For those who want to impress their customers with a great visual, we advise you to order the 200×200 or the 200×300 formats. 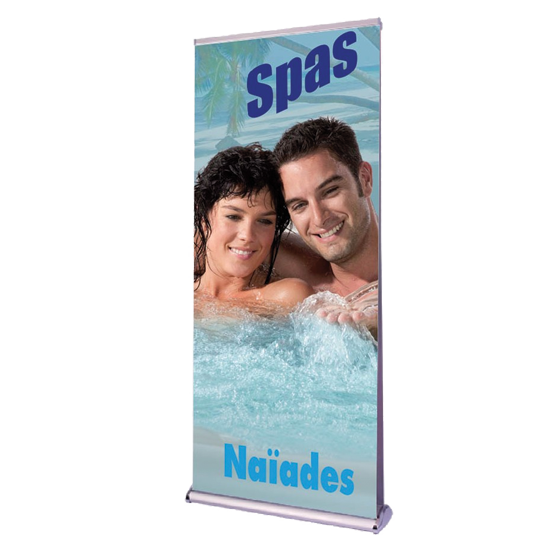 The Roll up or winder is a mobile communication banner. Its characteristics give it a strong visual impact. It is designed for use in trade shows and fairs. The reel takes up little space, is practical and can be transported easily. The graphic wraps around an aluminum support that serves as both protection and a stabilizing foot. The importance of the reel during a show is no longer to demonstrate. It allows any person to give a high visibility to its brand and its products and services. This is the major asset that can attract the eye and stand out from the competition. Depending on customer needs, we design reels in large formats up to 100×200. Some show organizers have support requirements. We perfectly meet all these requirements, whatever your customization needs (size of the cover, color, graphics, particular characteristics of the advertising message). 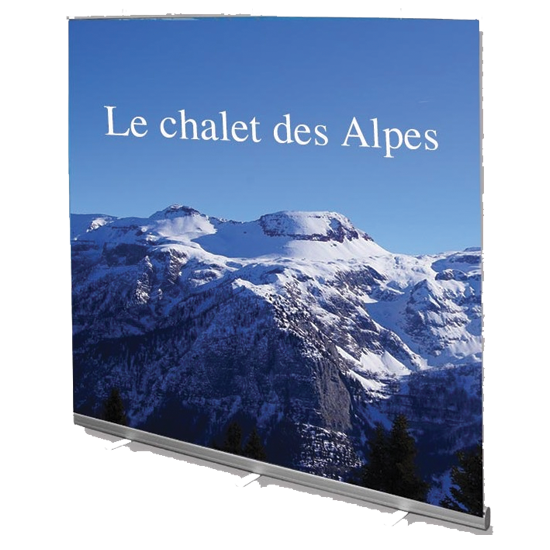 The roll-up is printed in high definition, and the mast used as support has all the guarantees of respect for the environment. The print fabric is of superior quality. It does not allow any reflection and optimizes the colors. Upon ordering your reel, it is delivered to you in a very fast time.